NSW DPI is proposing an eight week trial of SMART drumline technology on Bega Valley beaches starting in January 2019. Photo: DPI. The concept of being preyed upon by a shark in the deep, dark ocean while we are quite literally out of our depth is a primitive human fear. But how often are sharks actually in the same stretch of water as us humans? The NSW state government is taking steps to find out, trialling SMART drumline technology, along with drone and helicopter surveillance on east coast beaches as part of a state-wide shark management strategy. The strategy was first put into place after public outcry surrounding a cluster of 2014 shark attacks around Ballina and Byron Bay and has since been implemented on beaches between Evans Head and Lennox Head and also in Coffs Harbour, Forster, Kiama, and Ulladulla. The strategy is now moving further south. The Department of Primary Industries (DPI) is proposing an eight week trial of SMART drumline technology on Bega Valley beaches starting in January 2019, and is asking for community feedback via an online survey, which closes this Sunday (December 9). DPI staff hosted information stalls in Merimbula, Bermagui, Pambula Beach, and Tathra over the weekend (December 1 & 2) to demonstrate how a SMART drumline works and answer questions. Chris and Shelley Boynton of Pambula Beach dropped in despite the wild wind and rain of Sunday, and think the drumline trial is a good idea. While traditional drumlines have been associated with high fatalities of sharks and other marine species, the SMART drumline sends an alert via text message, email and phone call when anything takes the bait, meaning sharks are released alive and DPI scientists have the opportunity to tag their target species – White, Bull, and Tiger sharks. The large drumline hook is baited with a single sea mullet and is not designed to attract sharks, but to entice those who happen to be passing by. “If the community agrees to the trial, we’d contract a fisher to deploy the drumline every morning and be on call to tend the line within 20 minutes. Sharks can freely swim on a long rope in the time before they are released,” says DPI community engagement officer Kim Wolfenden. 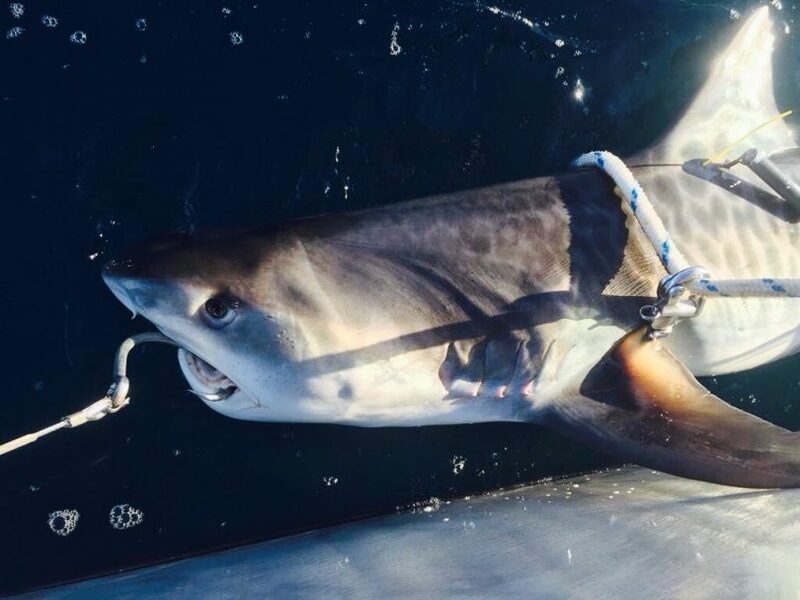 The 20-minute timeframe has been devised to minimise potential damage to sharks and Wolfenden says that tagged sharks recaptured after being caught on a SMART drumline have proven to be healthy. After a shark is released from the hook, it is tagged, netted and towed a kilometer out to sea. “Captured sharks often don’t return to shallow water for weeks, and sometimes months after being captured, so it is a deterrent,” Wolfenden says, pointing to information showing the movements of sharks tagged on the north coast of NSW in previous drumline trials. Some sharks traveled to all the way to New Zealand, while most made many laps up and down the south and east coast of Australia, covering up to 100 kilometers a day. Also taking shelter from the rain at Pambula Beach is long-time surf lifesaver Jim McGrath, who got his bronze medallion in 1964 and has seen plenty of sharks in his time. “I’ve counted 21 sharks in the wave line when the beach was full of people,” McGrath says. Although sharks do visit beaches, a myth DPI wants to bust is that of the local, resident great white shark “stalking and lurking,” says Wolfenden. “There is no evidence of resident white sharks. Large sharks, if anything, have been shown to be constantly moving from the data we’ve gathered,” Wolfenden explains. DPI staff hosted information stalls in Merimbula, Bermagui, Pambula Beach, and Tathra over the weekend – December 1 & 2. Photo: DPI. As the rain clears, Pambula Beach local Chris Briggs wanders past the surf club with his longboard. He too is supportive of the SMART drumline trial, saying that he has seen “heaps” of sharks over the years and has been “chased out” by the presence of sharks in the surf a few times. The information gathered through the shark drumline trials and drone surveillance can potentially alleviate some of McGrath’s – and the public’s fears. DPI already have a satellite listening station for tagged sharks located off the coast of Merimbula. 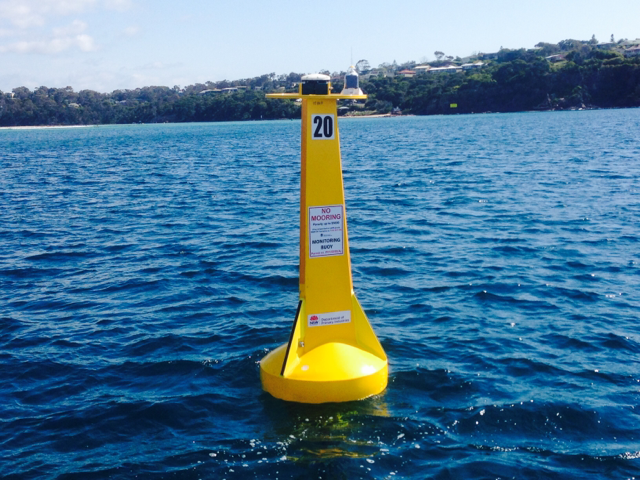 This big, yellow buoy detects tagged sharks that swim within 500 metres of the unit and alerts DPI’s SharkSmart app and Twitter – @NSWSharkSmart. Shark listening station – Merimbula Bay. Photo: DPI. Checking online for local shark activity before going out for a surf or ocean swim may soon be the norm, but for now, we rely on our iconic surf lifesavers to sound the shark alarm. On this blustery Sunday at Pambula Beach, McGrath has taken himself off the beach. To have your say on DPI’s proposed Bega Valley Shark Drumline trial, head to SurveyMonkey before December 9; the survey takes five to ten minutes to complete. For more information about the trial, head to the DPI website. 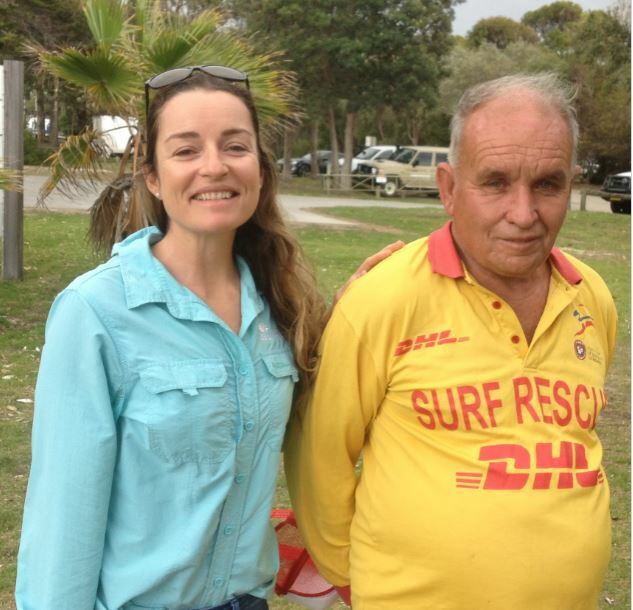 DPI community engagement officer Kim Wolfenden and longtime Pambula surf lifesaver Jim McGrath. Photo: DPI.